Clothing for snowshoeing is very similar to the clothing you would use to go on a winter hike. Snowshoes.com has more great info and resources. Layer two: Insulating layer - fleece, down, etc. You likely won't need this on the trail, but it is nice to have for breaks when you're standing outside. Need snowshoes? 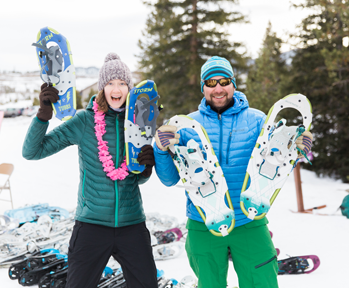 A limited supply of demo snowshoes will be available on a first-come, first-serve basis for FREE. We highly recommend you bring your own snowshoes or arrange for rentals. A list of rental locations can be found here.